After 4 days I was ready to stop smoking and I did so... Forget the patches, forget the gum, get this download it really does work. Our quit smoking hypnosis program will help you break through the 'negative trance' that nicotine has got you in - and don't kid yourself, it has got you hypnotized! Just think how often some 'trigger' - coffee break, the end of a task, seeing 'that person' - has you reaching automatically for that cigarette, even when you don't really want one. 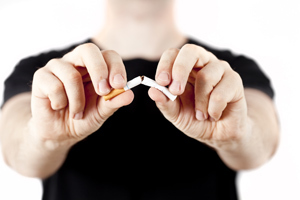 We understand that it takes more than will power to become a non-smoker again. We know that you need to make unconscious changes as well as conscious ones. Our quit smoking downloads in the table below, will put you on the fast track to being a natural non-smoker again. (1) A meta-analytic comparison of the effectiveness of smoking cessation methods. Journal of Applied Psychology. Vol 77(4), Aug 1992, 554-561.